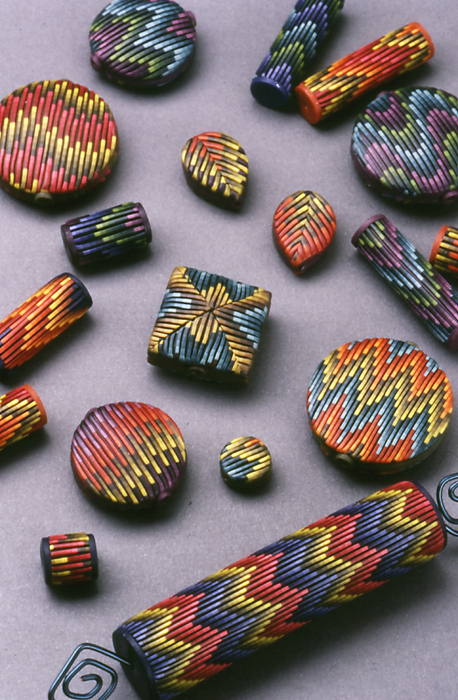 Over the span of three National Polymer Clay Guild Retreats at Shrinemont, I was able to witness the evolution of Laura Liska’s bargello beads. 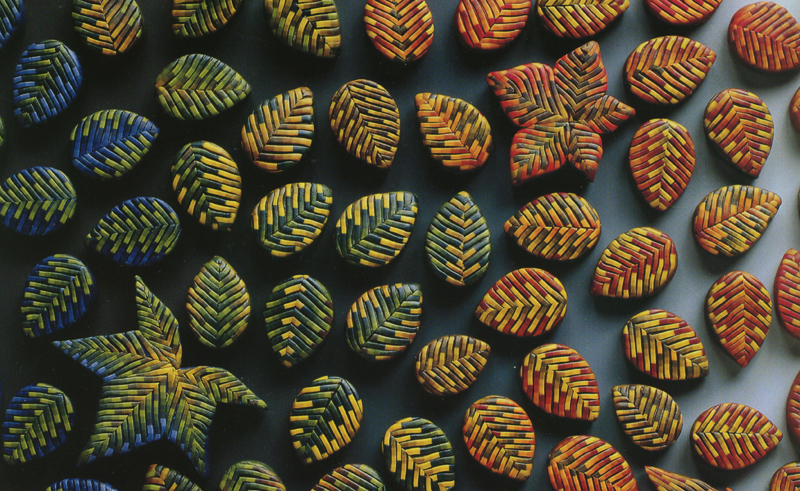 One year she spent hours mixing color samples that nestled back into a neat hexagram, another year she experimented with different shapes for her beads, earrings and necklaces. Every aspect of these designs were carefully engineered by her for precision, reproducibility of the color ways and beautiful finishing. In 1995, she was there with an entire box of band aids (I not sure if these were being used as precautionary finger mitts, or she’d actually cut herself), a large mound of gray scrap clay and several packages of straight stiff blades. Using clay as the spacer and carriage, Laura fashioned a cutter with a dozen parallel blades that could be used to cut even sized tube beads while the clay was still on the mandrel. She used this cutter to make small tube beads in the same colors used in her Bargello beads. Very clever, indeed! The only drawbacks were that the clay strips in between had to be made perfectly even and not distorted in assembly- and that the blades had a tendency to loosen and slip after heavy usage.